In my last post on Sabbath, we reflected on author Marva Dawn’s first Sabbath observation: ceasing. Today, as we live through short, chilling winter days, we turn to resting. When we cease, we give ourselves permission to rest. In Dr. Wolfteich’s course on Sabbath, we explored different Sabbath practices. One special practice for many people is a long afternoon nap. In an introduction later added to Abraham Joshua Heschel’s moving book The Sabbath, daughter Susannah Heschel describes how Shabbat often unfolded in her childhood (1951; repr. New York: Farrar, Straus and Girous, 2005). Following morning Shabbat services, she recalls that her family would slowly make their way home and share an “informal and lighthearted” meal—“a time for joking and teasing.” She writes, “After lunch my parents took their weekly nap, followed by tea and a walk in Riverside Park, across the street” (x). So often, I feel my body yearning for mid-day rest, but because of deadlines and schedules, I assume that I can’t afford the time to stop. Sabbath encourages us to say “Yes!” to our mortal, human, fleshy bodies and our physical need for quiet, naps, and down time. And as Dawn alludes to in the quote above, this rest goes deeper. It is a rest of the soul, rooted in God’s abundant, tender care. It is soothing and kind, and can be savored alone or enjoyed with friends. 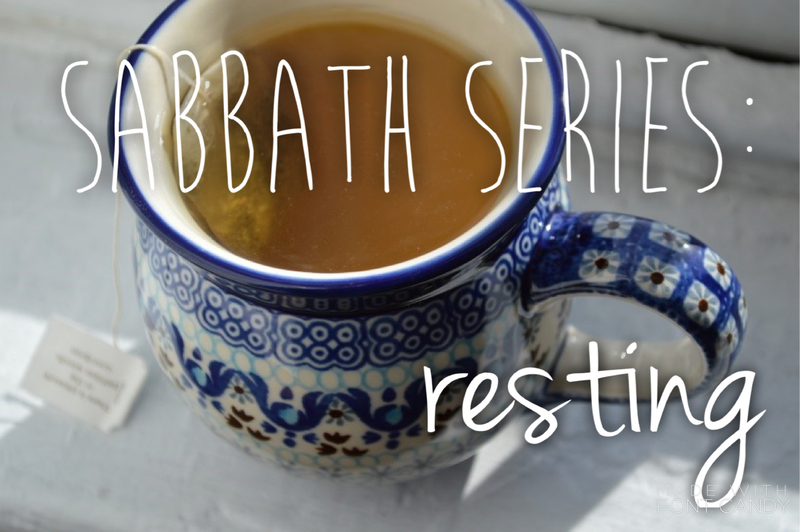 As you enter your Sabbath practice today, maybe you light a candle and make a cup of tea. Sit by the window and admire the good in whatever piece of world is around you: sky, a bird’s song, the bark of a tree or a tiny life form working its way out of a crack on a sidewalk or the snow or the rain. Take a walk around the block, or snuggle up on the couch and drift into a long nap. If you are looking for some inspiration, check out this tea method from Oh She Glows. Rest, physically, spiritually, emotionally. Rest alone in the presence of the world’s goodness, or alongside a loved one. May this rest inform our resolutions, studies, relationships, and growth in this New Year. This is the second reflection of an ongoing series on Sabbath. Feel free to join the conversation by submitting your own reflection! Chloe McElyea is a second year MDiv student from California. She loves ripe tomatoes, the smell of rain, stickers, and dark chocolate. She hopes to work in Community Nutrition one day.